Could these 3 business lessons help you and your Private Practice? Whenever I do something different in my business I always learn lessons. After all, when we step outside our comfort zone we learn and grow as a business owner. Whether it’s a big or small project, event, or just meeting someone new!! To me, it’s worth it to experiment and try different things. However, stepping outside of our comfort zone brings up all sorts of feelings. FEAR, doubt, uncertainty, excitement… sound familiar? Helping a client face that they have an eating disorder and that they need treatment. Reaching out to a new provider and asking for referrals to grow the practice. Helping a client’s family understand that “dieting for weight loss” is not going to help binge eating. Stepping outside my comfort zone and doing something publicly to get more people into a program. It was the first ever live webinar I ever did! It made me remember that we do important, yet SCARY work every single day… whether it is with our clients or with our businesses. I learned so many lessons from this latest project when I hosted the training and I am going to share my top 3 below. But, first I want to say that it was amazing to connect with so many of you and hear what you want from me in order to grow your own businesses. I plan to do many more things like this in the future and am so excited to support YOU by doing so! Because of this training, new students enrolled in my brand new Pursuing Private Practice for Intuitive Eating program! I’m so excited for them to grow their businesses. Here are the 3 lessons I learned during this project that will help YOU in your business. Hire support to help you with the things you don’t know how to do. A lot of you met Kathy from Pepper It Marketing on the training! She helped me organize the back end of technology, and helped me with the overall plan for the training. (She even pressed the record button, something I was supposed to do and forgot… saving me from a huge embarrassment and headache!) Whether it’s design, technology, social media or supervision.. invest in your business if you need more support. Things do not have to be perfect. I did the live training from my home office and not my private practice office. Some of you may know that I am renovating part of my house right now and it’s a huge mess! I usually try to work from my private practice office (not my house) but needed to do the training in my home office. If you could see what was going on in the background of the live training you would laugh so hard… There was live construction and painting going on, dirty carpets on the floor to help with the sound, and someone rang my doorbell in the middle! This proves my point that you do not need to have everything perfect and all ready to go before you jump in and do something. You just have to try. It will NOT be perfect the 1st time! Listen to your audience. After the training, I had many people ask me if I sold just the nutrition counseling section of the Pursuing Private Practice for Intuitive Eating program. Some of you told me you have had your private practice for years but wanted to learn more about Intuitive Eating and eating disorder recovery and how to counsel clients with these skills. Well you asked and I answered! The answer is YES! 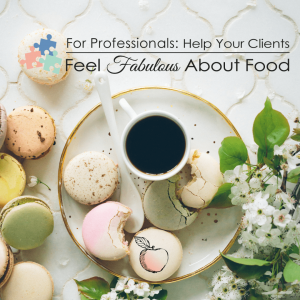 You can now purchase the For Professionals: Help Your Clients Feel Fabulous About Food course. This course includes the 4 modules on how to counsel clients that need more support with intuitive eating and eating disorder recovery: how the body and brain work together, how to detect hunger, fullness and satisfaction, all about emotional eating and body image, and how to help clients redefine health and well-being. The course also includes the training “Considerations for Clients that have Eating Disorders”, and “The Role of the RD in the Treatment of Eating Disorders” guide. Remember: There is no judgement… not for our clients nor for ourselves… No matter where you are in your business I give you permission to be there! Where we are in our practices does not matter, what matters is what are you doing to Make It Happen – no matter what your “It’ is. As business owners, we will keep learning lessons to keep improving. When you’re ready to take on anything big or small, know I am thinking of you and cheering you on. Nothing is ever perfect, and we’ll always be improving for the rest of our careers! This is the up and down journey of private practice! And it’s scary and fabulous all at the same time! PS. You can purchase For Professionals: Help Your Clients Feel Fabulous About Food course for only $297 until Sunday, March 31st at 11:59pm.